APRIL 2016 WESTERDAM VISITS FANNING ISLAND But…. 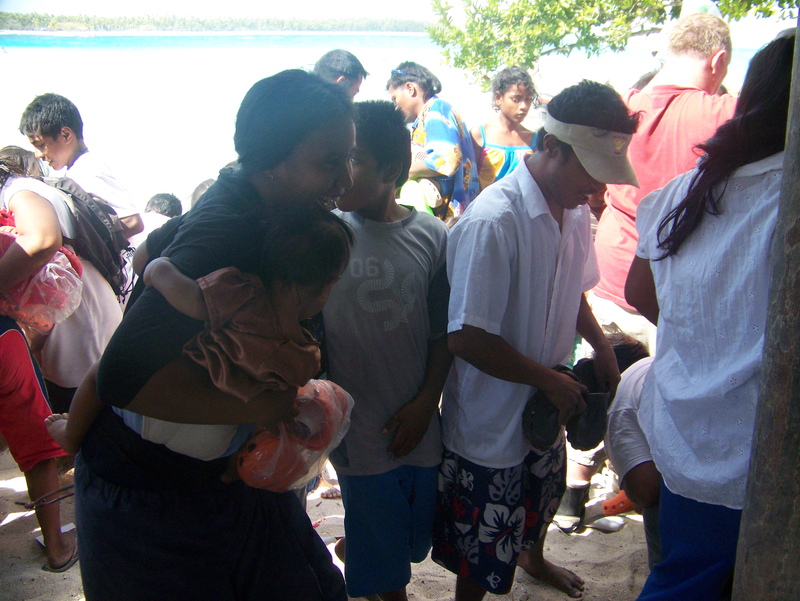 The recent mission trip to Fanning Island on the SV KWAI was a success. Somewhat! 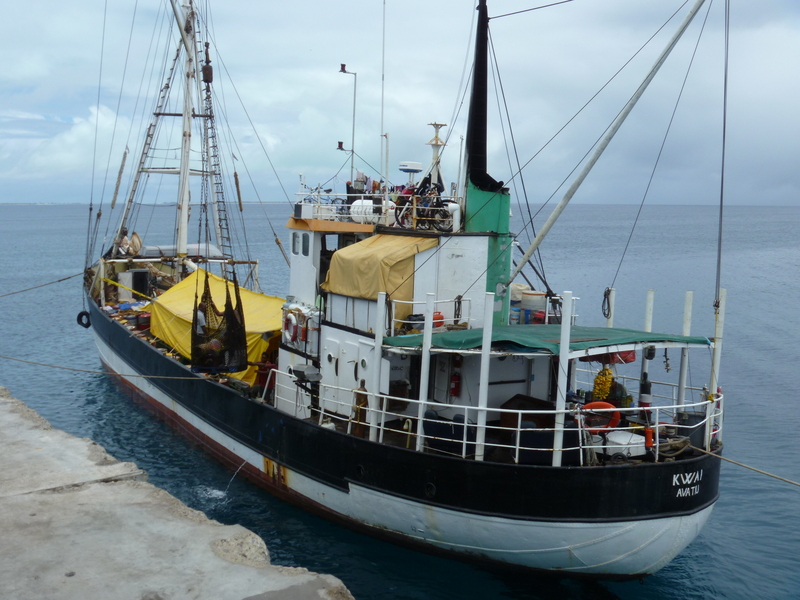 Local Kona Hawaii residents Bruce Boese and Pacific CARE Missions director Rich Smith flew to Christmas Island to join with the sv KWAI cargo ship and sail to Fanning Island. 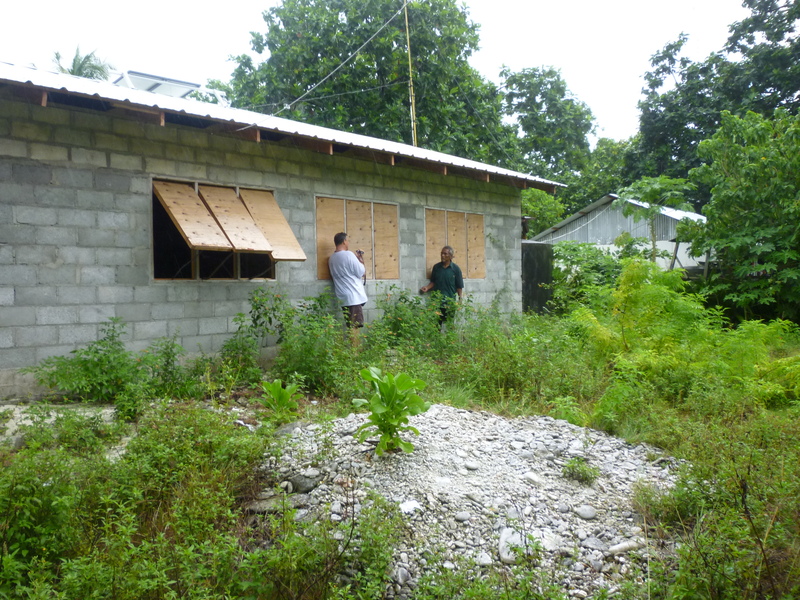 The purpose of the mission was to deliver and install the much needed window materials for the new Health Center, and do some follow-up on the great amount of supplies donated by the Rotterdam Cruise ship. We had plans to board the Kwai about four days after arriving to Christmas Island but a notice to us from ship owner Brad Ives, after being there only two days, was that the ship was leaving NOW for Fanning! We immediately grabbed our things and jumped on to the ship and left for Fanning Island 30 minutes later. The Minister of Education for the Islands had needed to charter the ship and make a visit to Fanning and Washington Islands, and return within the week to make a flight back to their home islands. This allowed us to only have two and a half rainy days during the weekend on Fanning Island. 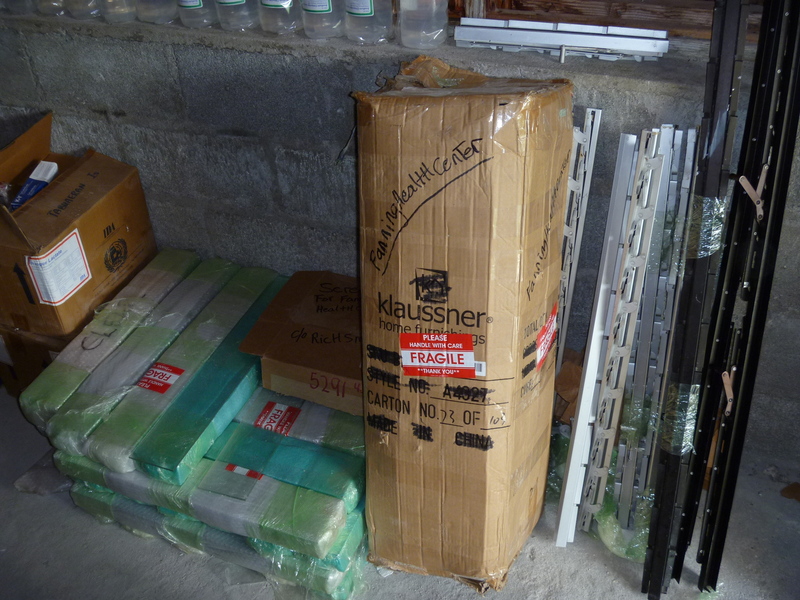 The window materials donated by a Kona Hawaii contractor, and other expenses sponsored by a compassionate church and member of Grace Gatherings Church, were successfully delivered to the Fanning Health Center by the Rotterdam Cruise ship when it arrived a few days earlier. 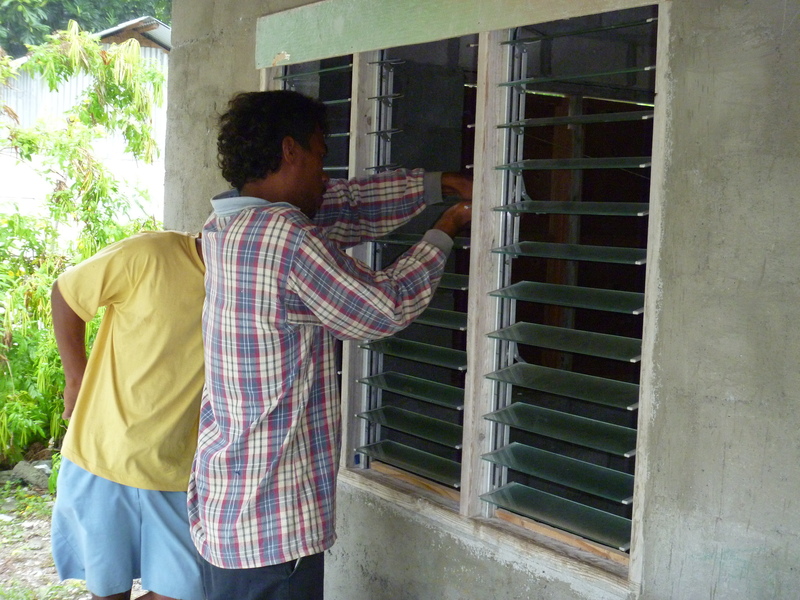 The hope was to have time to work with some of the local residents and install the louvered glass windows. Unfortunately, the nurse recommended that there be 2″ security wire installed afterwards, but none was available. 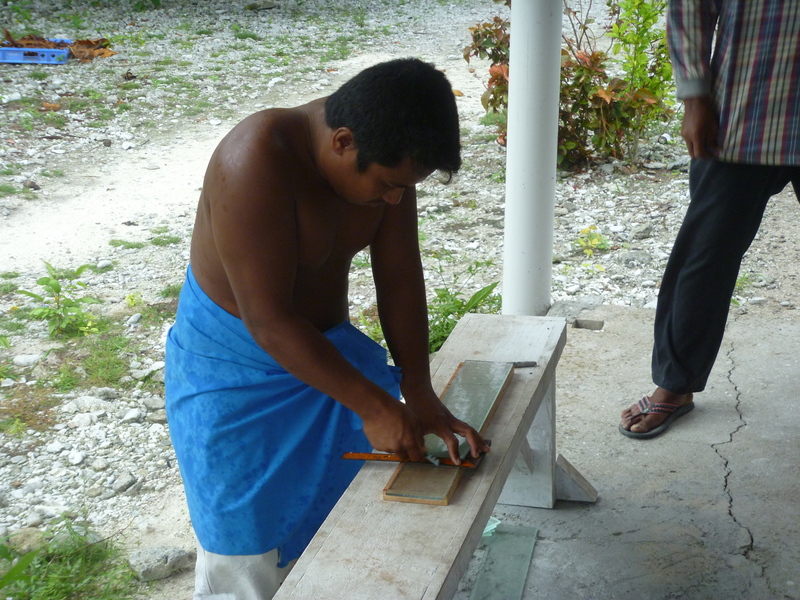 We were able to replace the existing front clear glass with the donated obscure type, and teach a few of the locals there how to cut glass, and install the jalousie mechanisms in the future, if and when some security wire becomes available and can be delivered to the Health Center. Please let us know if you would like to help in that immediate need to finish and secure the Health Center windows. This could be about a $400-$500 expense, and some upcoming opportunities to ship the wire during 2011 with the SV Kwai in August or future sailings of the Holland America cruiseships are being looked into. NOTE: If you are a future visitor to the island with supplies to donate, please contact me directly to find out the best method of giving the supplies to a trustworthy representative of the council, clinics or schools. 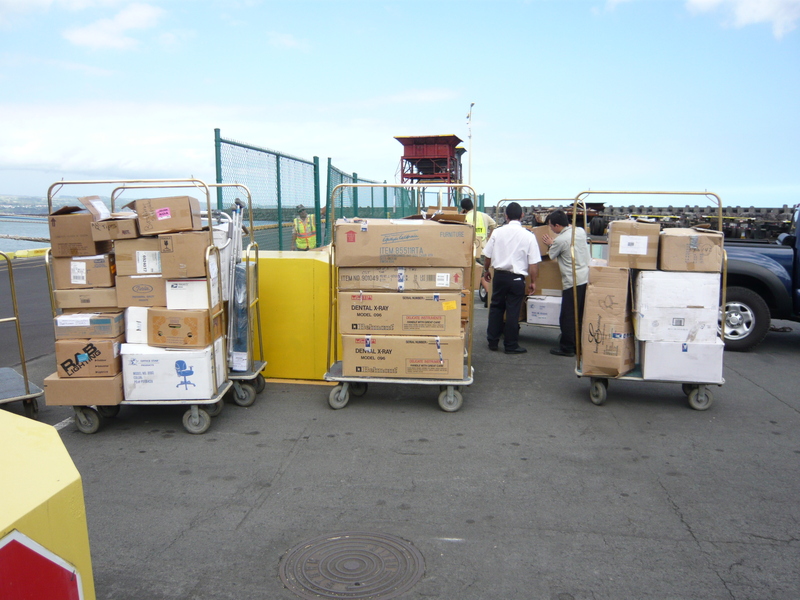 The November 22-December 22, 2010 Holland America ms Rotterdam Cruise was truly a special sailing with over three pallets (about 50 boxes) of donated supplies delivered to Fanning Island on Dec. 4th. 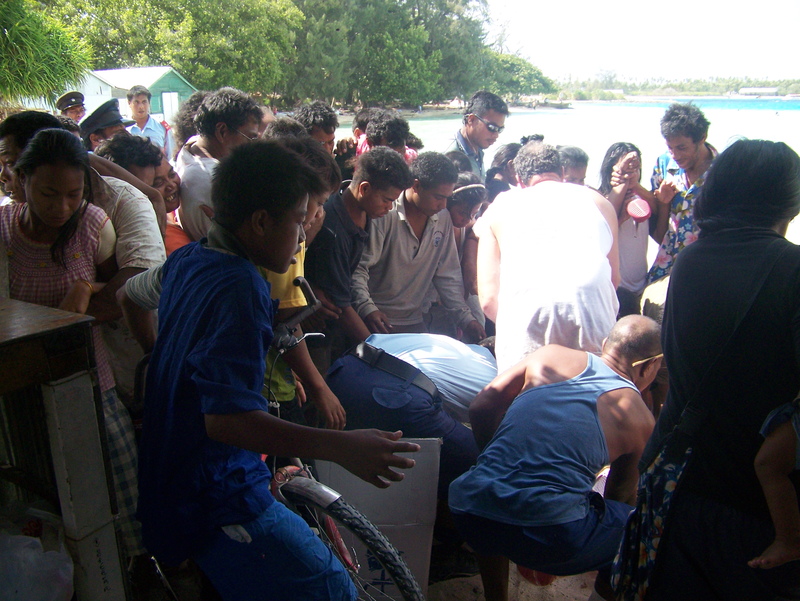 The January 2011 sailing also donated additional supplies and they successfully delivered them upon their arrival to the island. The ship and the many staff members have really gone out of their way to meet the needs of the islanders and the passengers who wanted to help donate their supplies. 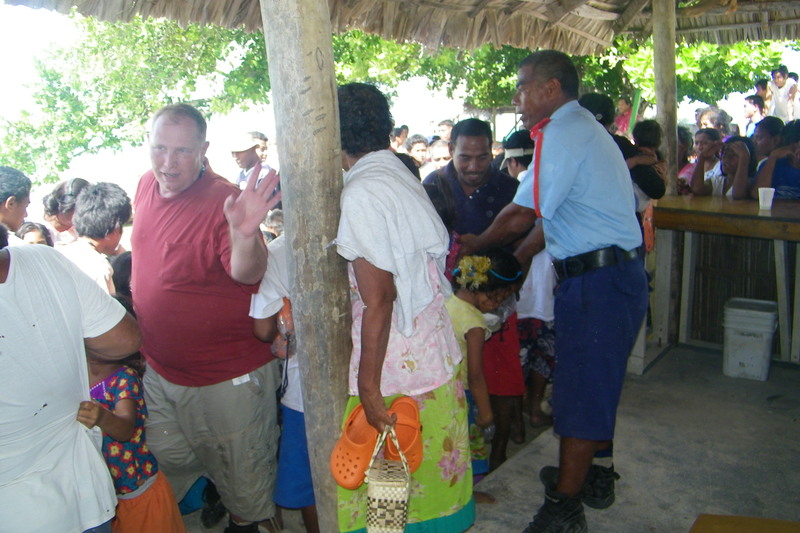 On the November 2010 sailing, the ship did approve and allow 3 private information presentations given to the passengers by Rich Smith / Director of Pacific CARE Missions. The last half of each presentation was alloted for question and answers to be addressed. Each gathering consisted of over 150 people who heard about the presentations thru the Cruise Critic and Vantage tour group members and by word of mouth advertising during the meals, other activities and/or other ship tour presentations. The responses were overwhelming, and the ship and the staff also became involved because of great information lectures from the ship’s Travel Consultant Lisa Kimsey and the Human Resource department leader Natalie Ansari got the word out to the employees who collectively donated personal items. The corporate office of HAL in Seattle also gave approval for the ship to donate many ship supplies such as old table cloths, cutlery and medical supplies (surplus). There were even some boxes of fruit donated from the culinary department to bless the local Donation Committee members who rarely get to enjoy those luxuries and much need food items. Hotel Director Hans Dernison and the Safety, Environmental and Health officer Ronald de Bloeme need to be commended for their extra effort to help in this life-saving and gift giving time so close to the Thanksgiving and Christmas season. 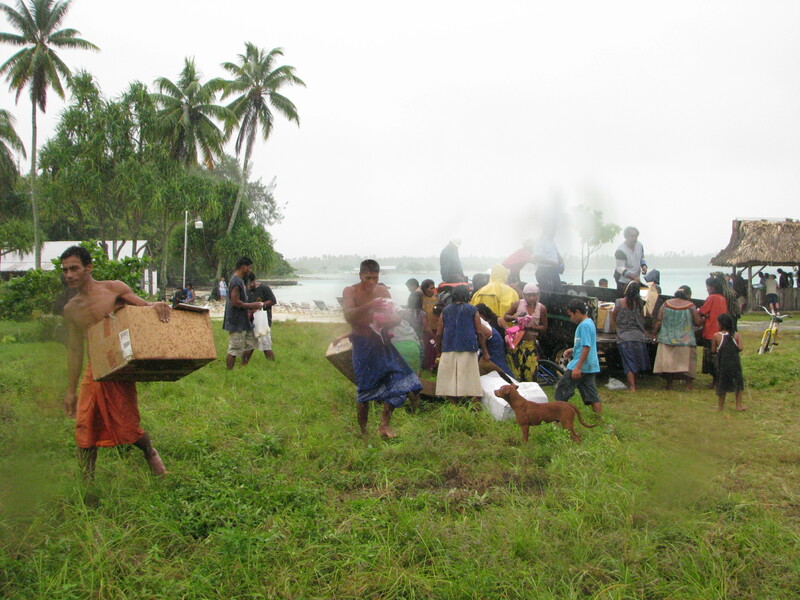 The information received from the island council, during their days of sorting and distribution after the ship departed, was the members were overwhelmed with so many supplies for the schools, medical clinics and the people. We are confident that after the upcoming January and March 2011 sailings donate their supplies, the island will be so much better off. There rarely are only a few cargo ships arriving with bare essentials for sale. 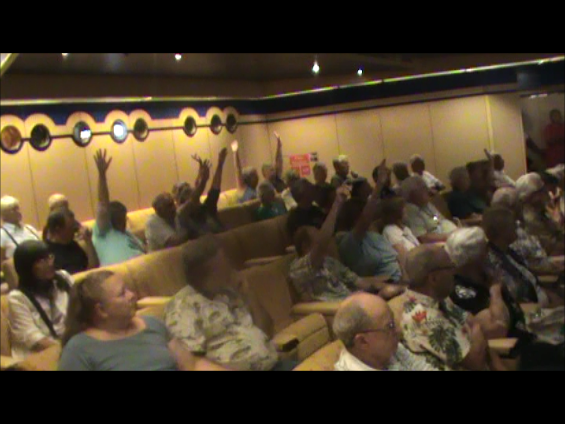 After the final follow-up presentation was given in the ship movie theater by Rich, a comment/survey sheet was provided to the passengers. The overall consensus was that Fanning was the highlight of their trip and they asked that HAL would allow future presentations and information to be given so the passengers would know more about Fanning Island before their arrival to Hawaii, and definitely the island itself. This rarely happened on previous cruises and always the passengers would complain “I wish I would have heard about Fanning before going there because I would have helped, or known better what to do when visiting there”. Thankfully, this was not the case for most of the passengers on this sailing, because the ship allowed for people to be informed before arriving to Hawaii and Fanning Island, and after visiting Fanning. 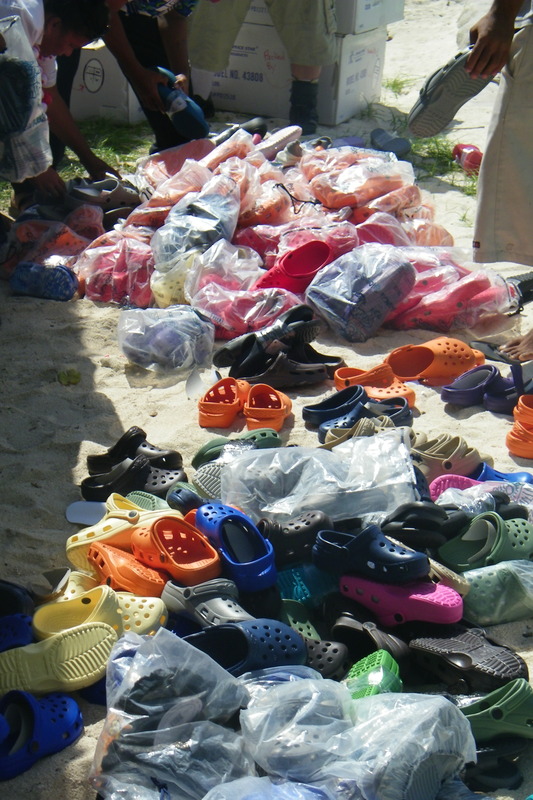 HIGHLIGHT NOTE from RICH SMITH: One exciting experience I had during our visit to Fanning was laying out over 200 pair of new donated Croc shoes on a narrow strip of sand between the beach and the donation/information booth. We quietly let the nearby officials select one pair of shoes for themselves and we marked their wrist with a magic marker so they would not try to return for more. In just a few minutes there were about 50 people then seconds later about 100 children, teens and adults crowding in to get a free pair. It became so difficult to hold the people off that we just had to jump out of way and let them go for it. In 15 seconds it was over and the crowd began to disappear. Later we could see many wearing their new brightly colored shoes. Some, for the first time. What a treat to see the smiles of the people again and that a pair of shoes just might save their life. I can only remember how one pair saved my life last year from a dog bite while visiting Washington Island! ﻿This newsletter update is currently being edited. Please return in near future to see any new updates of information and more pictures. Thanks for checking this page. Many Mahalos and God Bless! Great news! It is with much praise that we can tell you the new Health Center on Fanning has been built after two years of local volunteer labor and supplies donated by a Kona Hawaii resident and developer. 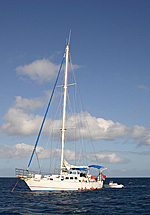 The Honolulu based cargo sailing vessel Kwai was very important as well by delivering the supplies. We can also thank the Norwegian Cruise Line company for their generous shipping opportunities to get many of the donated equipment and supplies of ours delivered during some of their cruise sailings to Fanning Island. 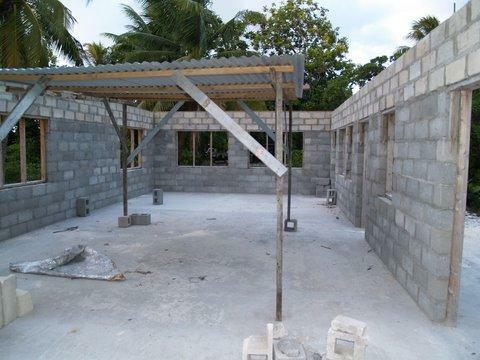 There are still many needs for materials to finalize the exterior and interior of the building. An exterior shower and toilet facility is being planned along with a catchment water storage system, plumbing and electrical are also needed to complete the project. 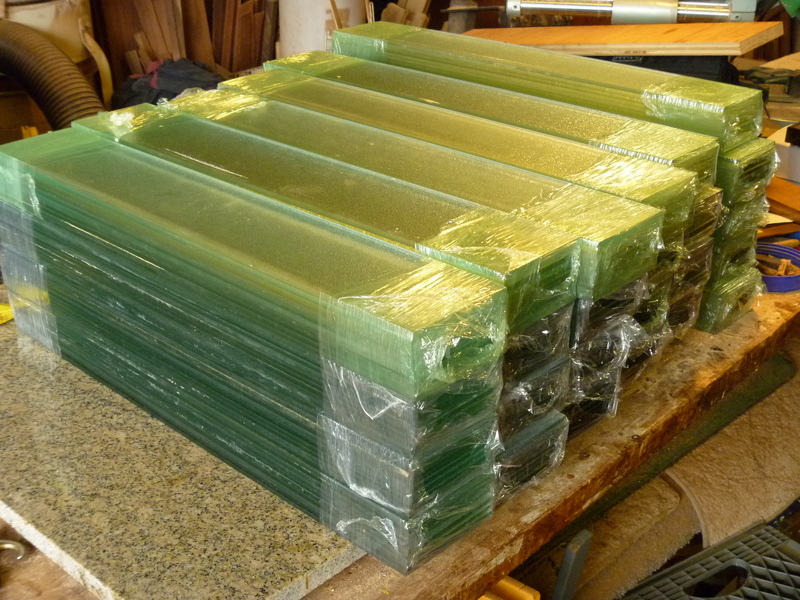 Currently (January 2011), there is a strong need to gather financial support to purchase and ship window glass and jalousie mechanisms to be sent on the March 2011 cargo sailing of the Kwai. 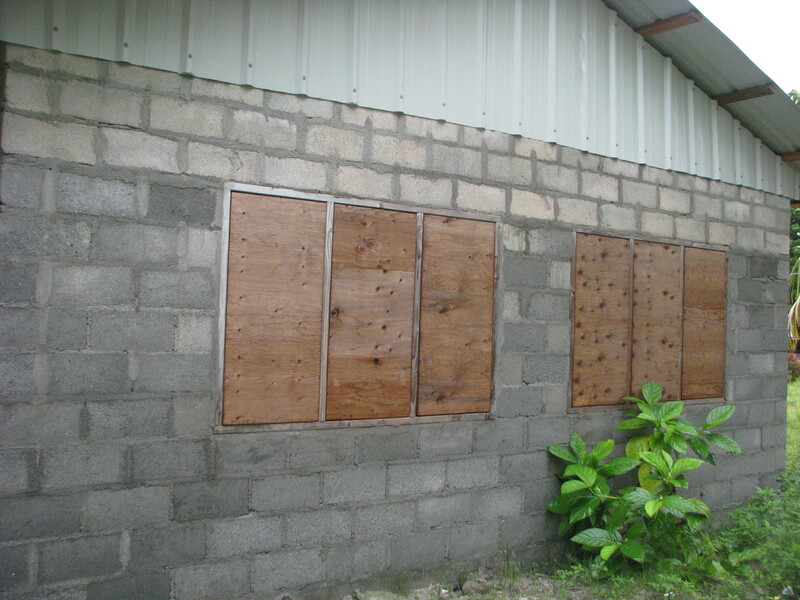 The materials would allow completion of the back and two sides of the Health Centers windows. This new facility is such a blessing to the nurse and the people as the three roomed building, now with donated gurneys and exam tables, makes treating people more effective. 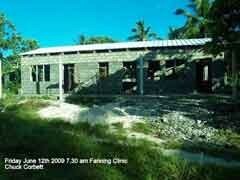 Many thanks to all who have helped and donated to make this facility possible to help save lives at Fanning island. 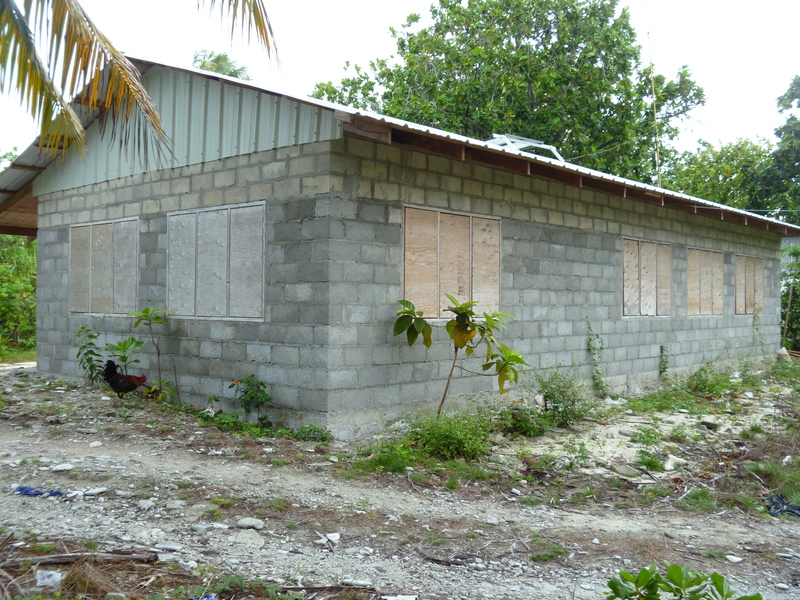 A new Health clinic is presently being constructed with the help of local Fanning Island volunteers and materials donated from Hawaii. 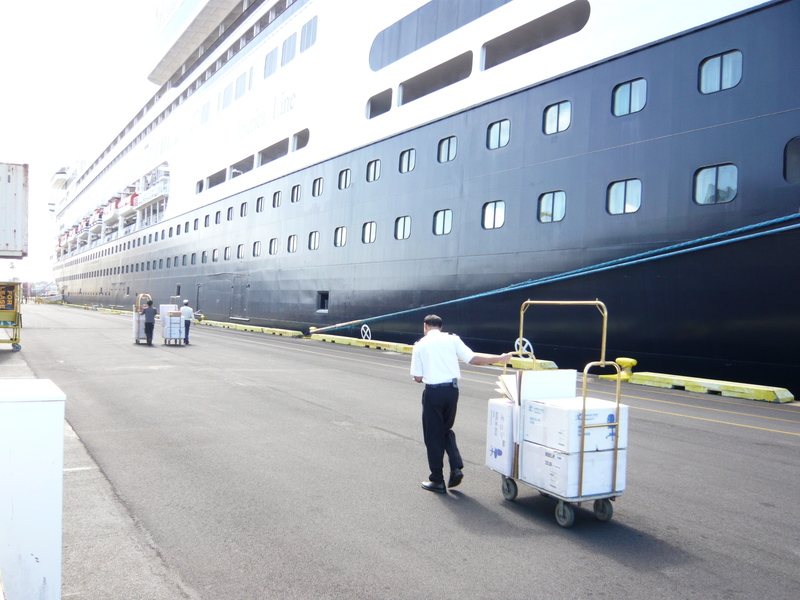 The recent January 2010 Cruise Supply Mission to deliver supplies to Fanning Island was successfully completed thanks to the help of the many volunteers and the Holland America cruise ship MS Rotterdam. 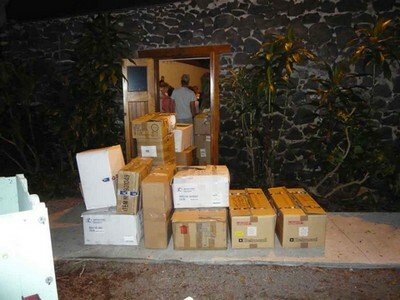 Over 45 boxes of supplies consisting of medical surplus and Crock shoes and various sandals, donated from local residents and businesses of Kona Hawaii, were given to the newly opened Fanning Health Center and to the local residents who were gathered at the market area when the cruise ship passengers arrived. The day was cloudy and had off and on rain showers that added to the wet and flooded conditions due to about 2 weeks of rain before our arrival. It made for difficult walking and truck tours available by one of the local touring type trucks. 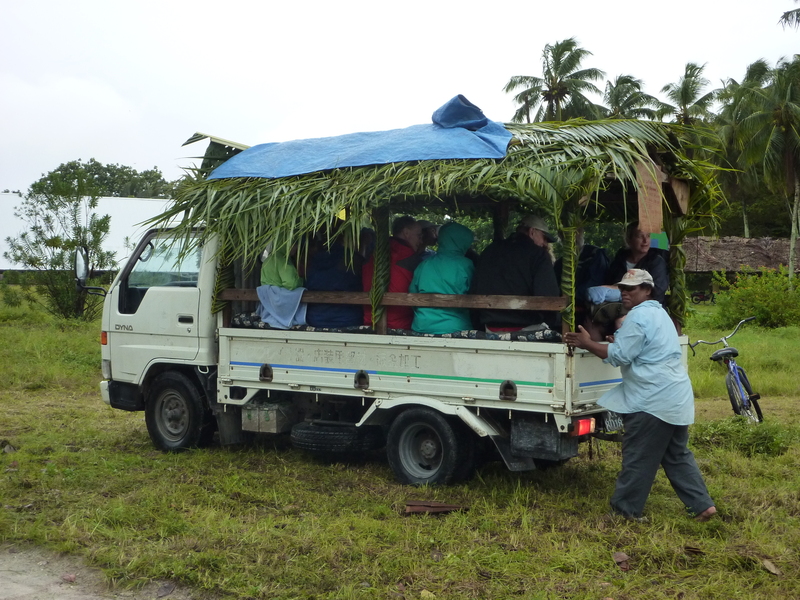 Each passenger could pay about $10 and travel with approximately 12 other people on the island’s only main road for a couple miles thru some of the nearby villages. The people definitely get an idea of how primitive and beautiful the island was. I am sure it was not the easiest, nor the smoothest ride, but well worth the adventure with cameras in hand and sharing the trip with others. The intermittent showers and cloud covering was actually a comfort from the usual hot and sun-baked conditions the island has. 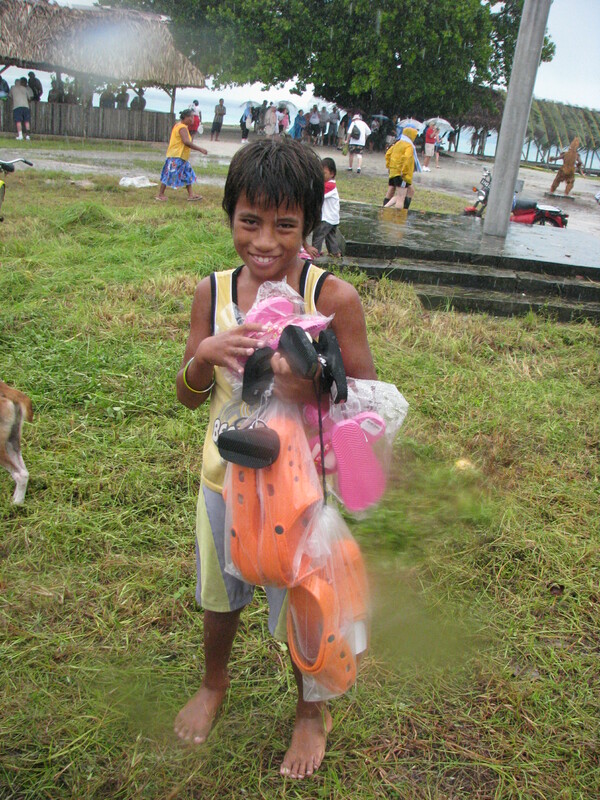 Once all the supplies were delivered to the government building, we were then allowed to take over 500 pairs of crocks and slippers to the flagpole area, and with the help of a local police officer and a couple of coordinators the foot-ware was freely given to those lucky locals that were there. 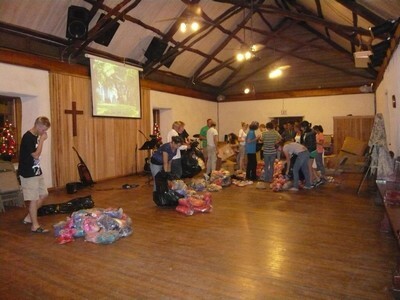 In the matter of minutes, all the foot-ware was freely given away, and even the large empty boxes became gifts to the people. I am sure they probably needed them to store things in, for firewood and a couple of them actually ended up at the dancing area where they were used as drums during the singing and dancing shows. Many of the guests from the ship, who attended our few Q & A sessions, enjoyed taking a walking tour to see the new Fanning Island Health Center. 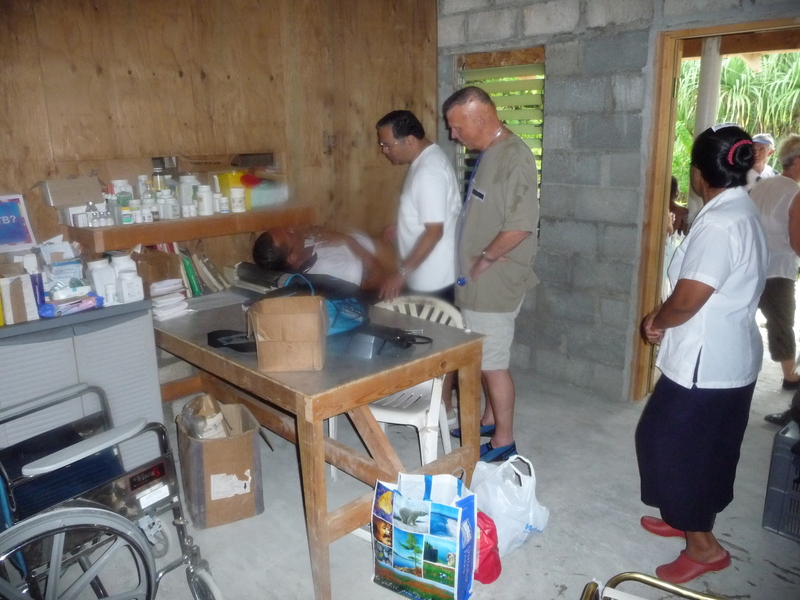 It was a great opportunity to see the clinic enclosed and being used to treat the local people. There were also a couple of serious health needs that got examined by the two visiting ship doctors who volunteered their time to help the local people. 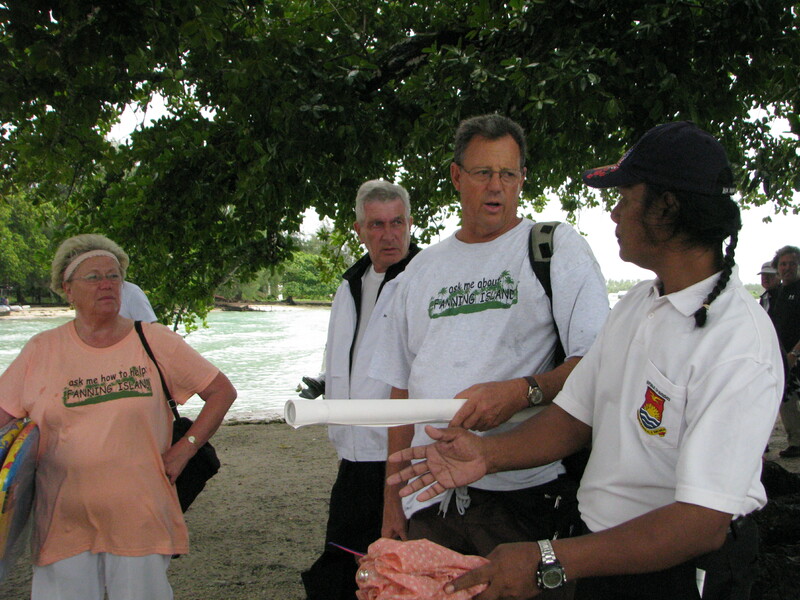 After our visit to the island, those guests that did tour the island had such a positive attitude and desire to help the people of Fanning Island. Much of the around the dinner table conversations for the next couple of days were filled with Compassion to help the island and Hope that someone would follow-up with meeting the peoples needs on the island. As with many similar voyages that called on Fanning Island, the concerns and desires to help seem to be a very short term feeling. Thankfully, there are some who have attended our Question and Answer periods, and are compassionately helping in some small or large way. 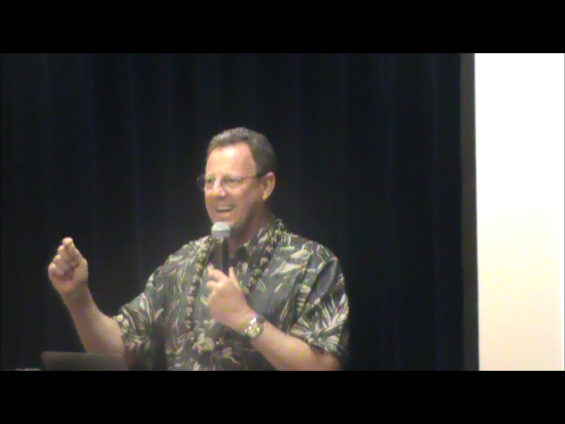 If the Holland America ship would allow public guest lecture presentations while on the way to Hawaii, and then also before arriving the island, so much help could be given to the locals and their health clinics. Many of the complaints from the passengers are “I wish the ship would have told us about Fanning Island before getting there because I would have bought or brought some things to donate or help the people with.” They also have said: “Why doesn’t the ship give presentations or let you tell us about Fanning Island. It would have been so helpful to us?” All I could usually reply to them is “I am sorry but the ship has a strict policy on Guest lectures and can not allow a Guest lecture unless approved for the Seattle office. I hope those of you who are reading this now will understand the praises and disappointments of this last mission. 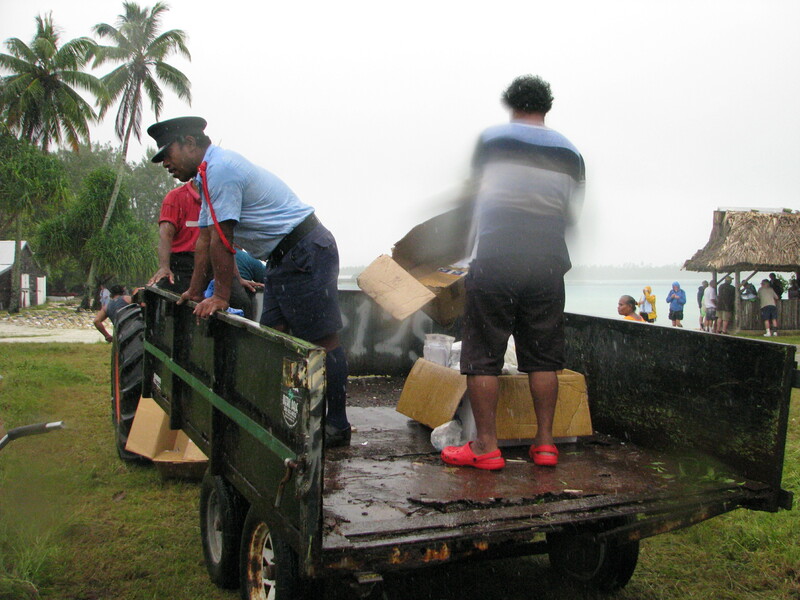 All in all, it was a very positive and life saving opportunity to help the people of Fanning Island. Presently I am looking to do the November 22nd Rotterdam sailing with more supplies. I do need your assistance with getting more supplies, covering the expenses of shipping and delivering and helping the new Health Center get finalized. Please view our Needs page on this website to see what supplies are desired and requested by the nurses. 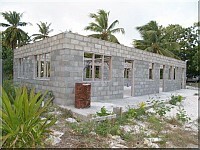 There is also many needed materials to complete the new Health Center. Please also note that school supplies are another continual need. For more infos click on the visit FANNING tab. Thank you for taking the time to read this information and help in some Compassionate way. May God bless you and meet your needs. 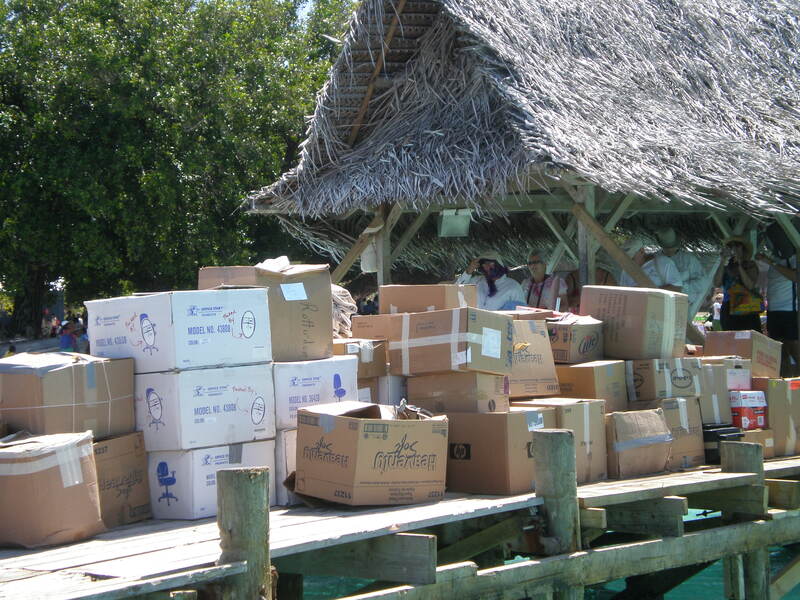 Donated supplies were sorted, boxed and made ready to be shipped for the January 4 2010 Cruise Mission to help the Islands of Fanning, Christmas, Rarotonga, Bora Bora, Papeete Tahiti, Moorea, Rangiroa and Nuku Hiva. 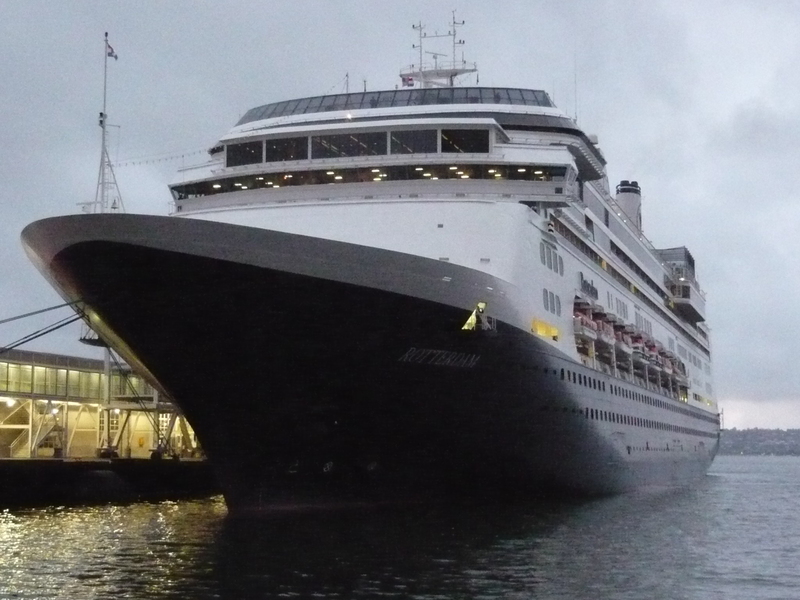 Holland America Cruise Lines scheduled three sailings to the Pacific Islands for during the 2010 New Year. Our hope was that they would deliver many of our donated supplies that had been collected over the year, with the approval and help from the ship. The sailing departed San Diego California, for a full itinerary of visiting various far away Pacific Islands, and returned back to San Diego 33 days later. The ship first sailed to the Hawaiian Islands, and visit the islands of Hawaii, Maui, Kauai and Oahu. During these various stops, the donated supplies that have been collected (and possibly will be purchased during the cruise) were loaded onto the ship for delivery to Fanning Island, where most of the clinical and school supplies are needed. The supplies included many new ladies slippers that were donated last year from the two NCL ships that have discontinued sailing here in Hawaii and to Fanning Island. 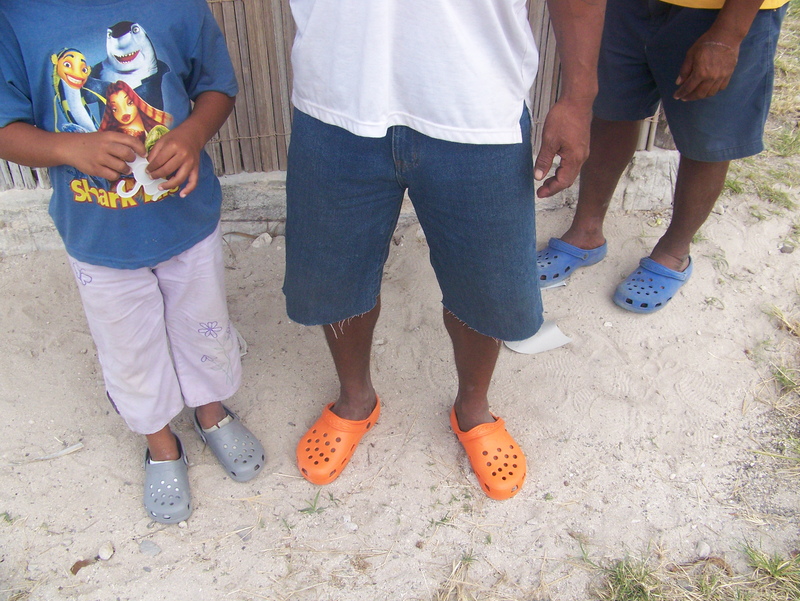 The people who receive the footwear, and wear them, would then benefit from the safety the footwear can provide while walking in brush, on rough terrain and contaminated parasitic and infectious soil conditions the islands have. 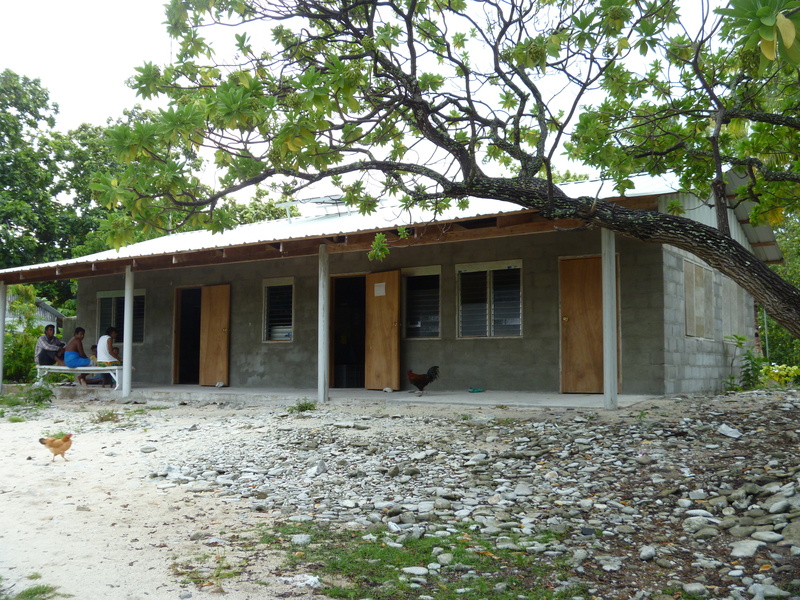 Another important need for going on this voyage will be to assess the new, and soon to be completed, clinic on Fanning Island. The final stages of the finish work are taking place, and many needed materials for the completion to take place were requested by the island council, to a fellow developer here in Kona. Information that was collected would help the developer to determine the next package of supplies needed to be sent by a cargo sailing vessel that deliver supplies to Fanning Island about every four months. 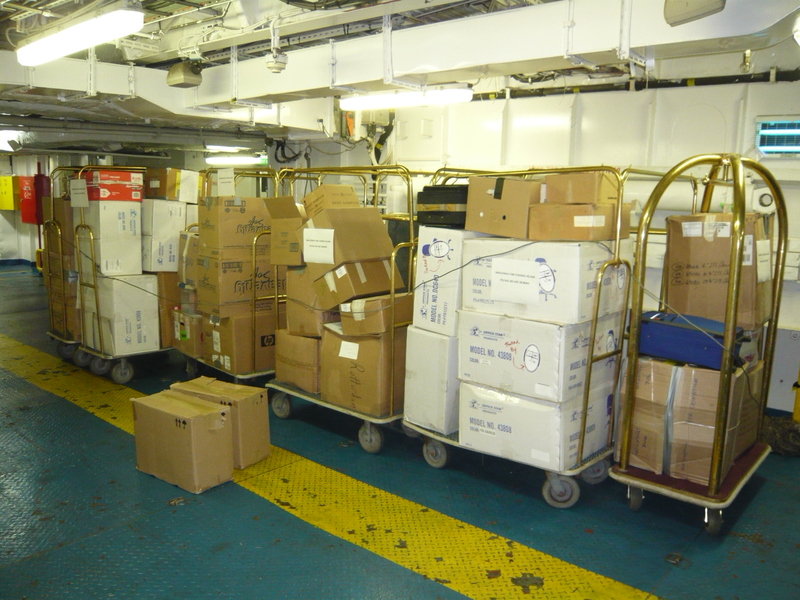 It was everyone’s hope that we will be able to transport a very large amount of supplies during this cruise. If you would like to help with the financial needs to make this possible please feel free to contact us. A tax receipt is available for any donated supplies and financial donations towards purchases necessary to fulfill the needs of this mission. Thanks you so much for your partnership and compassion to especially meet the needs of the people in the Pacific Islands thru our ministry. Please do view the various media clips provided on this website to obtain more information. I wanted to let you know that our team and I have finally returned safely and well from our recent medical/supply mission to help the people of the Line Islands. It was a grand adventure and many lives were impacted by the things that were done through us and with the help of you and many other people. 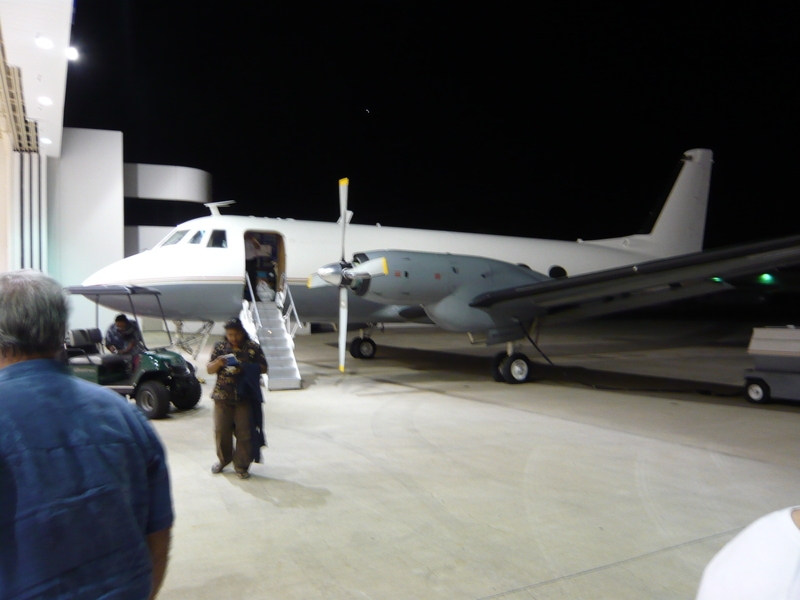 There were more than 3 pallets of supplies sent, distributed and used during the mission. We had an awesome adventure flying into Christmas Island on a small passenger twin engine prop plane and then sailing on Chuck Corbett’s chartered sailboat with many of the supplies to be delivered to Fanning and Washington Islands. 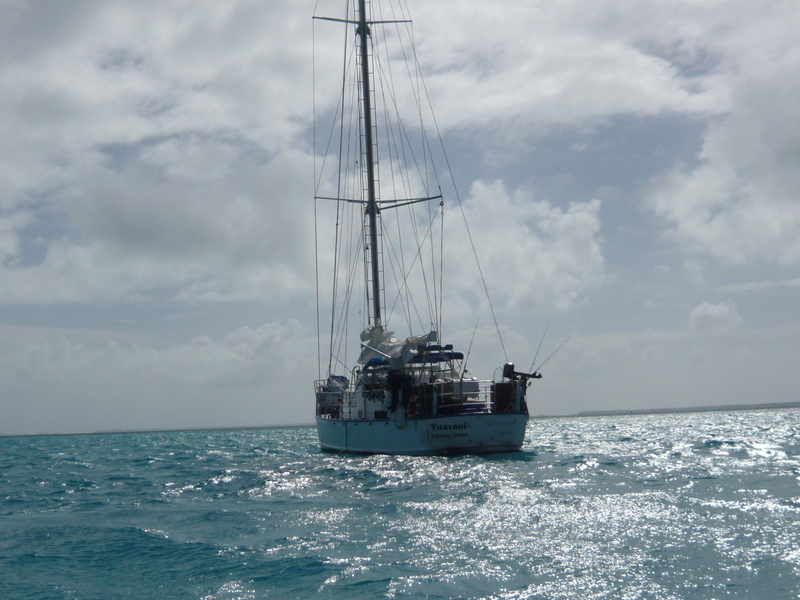 We first sailed towards Washington Island (2 ½ days sailing) and during the night we had a problem with the main sail. This caused us to detour to Fanning Island and do about 4 days of missions-work there before sailing up to Washington Island to do another supply drop off, assessment of their needs and dental mission. Looking back we feel it was meant for us to arrive at Fanning first, when we did, to tend to our friend Brunno who was seriously infected with a leg wound. I believe we saved his life by being there those first days to tend to his wound and see the nurse be taught how to keep dressing and bandaging the wound. Along with helping Brunno, many people were treated by our team member Bill, a 70 yr. old retired dentist, who pulled over 600 teeth (about 200 + patients) while sitting on a 5 gallon plastic bucket, most of the day, for about 4 total missions! Thanks for the prayers for protection and divine appointments as they were answered. Especially for protection, as I was bitten on my left toes by a dog at Washington Island while riding a motorcycle. Thankfully, I was wearing a new pair of Crocks (with a rather thick toe material) I bought in Kona, before going on the mission, and just happen to decide to wear them that morning because I noticed my slippers were about to give out. I thought I would take the Crocks as backups. 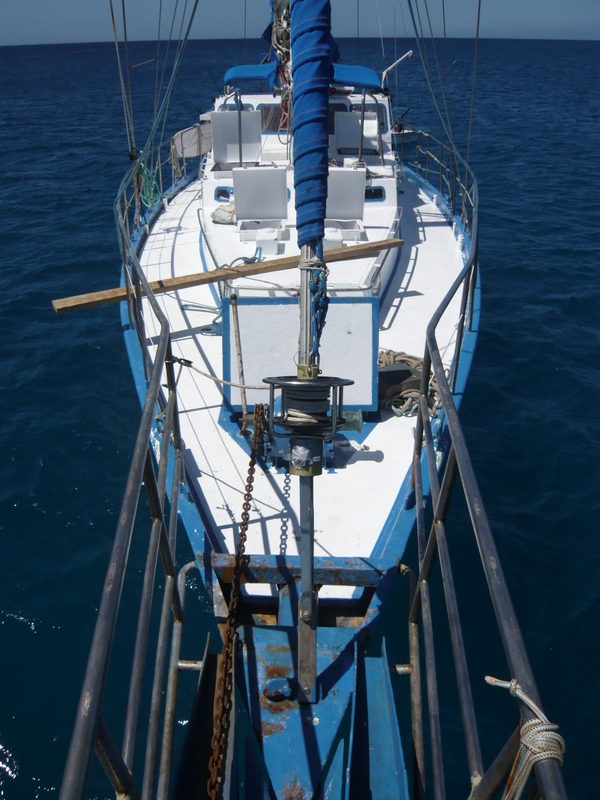 If I had been bitten without the Crock on, it could have been a very serious thing with four days of sailing to get back to the main hospital at Christmas Island. I just know it was something covered by prayers as the dog really should have gone for the leg/ankle and not the toes on my left foot. What a close call! How many other close calls we had, we will never know. At this time, I wanted to share with you that the local TV station KHNL news 8 has aired a short video interview (if available) about this recent mission. Please view it at the following address http://www.khnl.com/global/story.asp?s=9816264 or read below to understand more about what happened. All in all, what a powerful mission/adventure and team effort. Thanks much for your friendship and partnership. HONOLULU (KHNL) – A group of health care providers and volunteers are coming together to help people living in one of the most remote places on Earth. The people of Fanning Island smile brightly even though their situation may not be so bright. 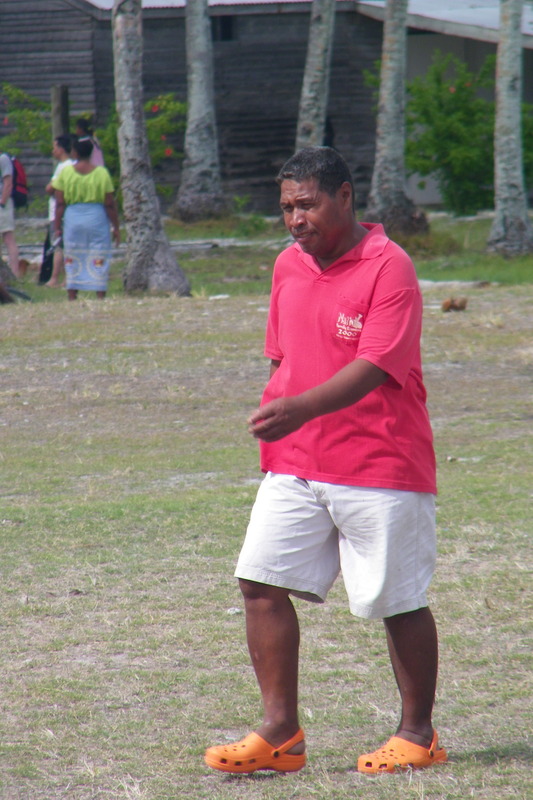 “About four percent of the children die before they get to one-year-old” said volunteer Rollin Caristianos. “Without help from the outside, they’re pretty much left to die” said volunteer Rich Smith. “There is a doctor on Christmas Island but there’s no doctors on Fanning or Washington” said Caristianos.Their isolation, is another. “Cruise lines used to go there on a regular basis about every ten or eleven days. Last year, in April they decided not to go anymore. That pretty much stopped their economy of selling crafts and having some income from guests coming off the cruise ship” said Smith. So Hawaii island residents Smith, Caristianos and friends chartered a boat and sailed off on a goodwill mission to deliver much-needed medical supplies including exam tables and hospital equipment. Other doctors came to help. 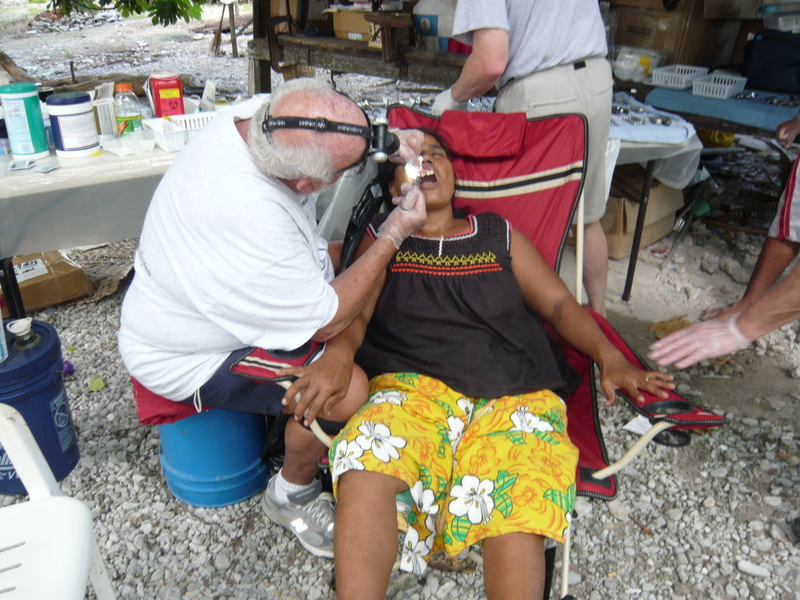 One even provided dental care.”…sat on a five gallon bucket and pulled teeth all day long” said Smith. “It was very obvious from their smiles and gestures they were very appreciative of what we did” said Caristianos. And when they go back, they hope to bring more medical supplies and other donated items to the people of Fanning Island.